The president last campaigned for Deeds in August. WASHINGTON (CNN) - A well-known Democratic strategist in Virginia is blasting the White House for placing anonymous quotes in the Washington Post in a pre-emptive effort to blame Creigh Deeds for what might be a loss in the state's upcoming gubernatorial election. David "Mudcat" Saunders, who gained political fame helping Democrat Mark Warner reach out to rural voters during Warner's successful 2001 gubernatorial bid, told CNN Friday that trying to blame Deeds is "bulls**t" when Democrats around the country are "just tired of politics." "The Democrats right now are a real bruised brand right now where I am," Saunders said in a phone interview from his home near Roanoke. "There was so much energy put into last year's race, everybody's just burned out. You can't get anybody fired up." In a story published Friday, a senior administration official told the Post that the Deeds campaign ignored their advice to embrace the president, which the official claimed would have boosted the Democratic candidate's lackluster support among the African-Americans and young voters who supported Obama in 2008. Obama is making his third trip to New Jersey for Jon Corzine. 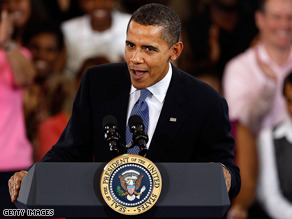 WASHINGTON (CNN) – President Barack Obama will head back to New Jersey next weekend to campaign for Gov. Jon Corzine, who is in jeopardy of losing his re-election bid, CNN has learned. "The Corzine campaign is excited to announce the president will be back in New Jersey on Sunday, November 1st making two stops in the state," Corzine campaign manager Maggie Moran told CNN Friday in a telephone interview. Recent polling shows Corzine locked in a tight battle with Republican nominee Chris Christie. Obama’s appearance comes two days before New Jersey voters head to the polls in one of two high-profile gubernatorial contests in 2009. Obama has also visited Virginia on behalf of Democrat Creigh Deeds, who is trailing Republican Bob McDonnell in the race for governor. Romney has raised money for McDonnell numerous times. WASHINGTON (CNN) - Former Massachusetts Gov. Mitt Romney is coming back to Virginia yet again to help Republican Bob McDonnell in the final week of his gubernatorial campaign against Democrat Creigh Deeds. And he'll make the trip one day after President Obama is set to make a high-profile appearance for Deeds. The McDonnell campaign announced Friday that Romney will appear with the entire Republican ticket - McDonnell, Lt. Gov. Bill Bolling and Attorney General candidate Ken Cuccinelli - at a series of press conferences throughout the Commonwealth next week. The photo-ops will take place in Virginia Beach, Roanoke and Richmond next Wednesday. Obama will appear in Norfolk on Tuesday. Romney has already visited the state several times this year to raise money for both McDonnell and Bolling. If they both manage to win on Nov. 3, chances are they'll repay the favor if Romney decides to run for the White House in 2012. Rapper Ludacris to run against Obama? WASHINGTON (CNN) - He's already an accomplished rap star with an impressive acting resume. But for Cris 'Ludacris' Bridges, platinum selling records and academy-award winning films isn't enough. His next endeavor? A bid as a 2012 presidential hopeful. In an address to the National Press Club in Washington Friday, Ludacris joked that "as long as they don't use some of the things that people want to criticize me for in the past during my Campaign. I feel like I have a very strong chance of winning." He is perhaps best known for his sometimes-controversial lyrics. His 2008 release of "Politics" was meant to show support for then-candidate Barack Obama, but it was received unfavorably by some for its negative comments toward then-Sen. Hillary Clinton and Sen. John McCain, among others. 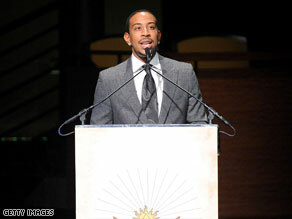 Ludacris is in Washington hosting the 6th annual gala dinner for his philanthropy, 'The Ludacris Foundation.' He noted that with his organization, he is "answering President Obama's call to service." "The Gala will recognize the achievements of five individuals with a rich history of giving back and who demonstrate a strong commitment to community service," he said according to a release. The foundation is presenting Rep. Maxine Waters with its first annual Congressional Leadership Award. The Ludacris Foundation teamed up with the California Democrat in providing assistance to underserved communities in her district of South Central Los Angeles. Other honorees include legendary music producer Quincy Jones and BET CEO Debra Lee. 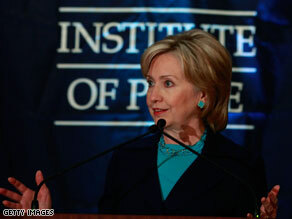 Secretary Clinton will visit Pakistan 'soon,' official says. WASHINGTON (CNN) - Senior U.S. diplomat Richard Holbrooke announced Friday that Secretary of State Hillary Clinton will visit Pakistan "soon," but said details of the trip would be withheld for security reasons. "So I am not going to talk about timing, details or who she [Clinton] is going to see.," Holbrooke said at a special briefing at the State Department. "Except to say she will see the leadership of the country, the leading members of the opposition, civic society, businessmen and as many people as she can in a limited period of time, with the limits of a very, very dramatic situation going on." Clinton's visit comes as Pakistan is fighting a major military offensive against the Taliban - and reeling from a wave of terror attacks that have caused hundreds of deaths. The country also faces new tensions with the U.S.
Holbrooke, as other U.S. officials have done in recent weeks, again said that billions of dollars in U.S. aid to Pakistan places no conditions on the government or the military there. Pakistan politicians have accused the U.S. of meddling and micro managing. Carl Levin's spokeswoman confirmed the Senate Armed Services Committee will hold a hearing next month on the controversial 'don't ask, don't tell' policy. 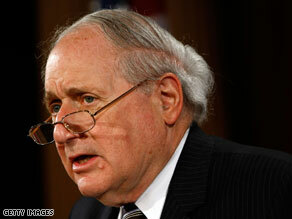 WASHINGTON (CNN) - The Senate Armed Services Committee will hold a hearing next month on the controversial "don't ask, don't tell" policy banning gays and lesbians from serving openly in the military, committee chairman Carl Levin's spokeswoman confirmed Friday. The precise date for the November hearing hasn't been set yet, said Levin spokeswoman Tara Andringa. The Michigan senator, who supports ending that policy, made the announcement after a Friday event marking the passage of a bill that extends hate crimes protection to victims assaulted because of their sexual orientation. "My hope is that we are going to find a way to repeal 'don't ask, don't tell," Levin said, according to AFP. The Armed Services Committee had previously announced it would debate the policy sometime this fall. President Obama has faced criticism from the gay community for not moving forward quickly to repeal the policy. Earlier this month, at a fundraiser for a gay rights organization, he pledged to end the practice of discharging members of the military because of their sexual orientation, but did not give a timeline for when that might happen.